Denim became a popular fabric for making workers clothes in the 18th century due to the fact that it is very durable and resists a lot of wear and tear. Two Americans – Levis Strauss and Jacob Davis were the first to make trousers of this material back in 1873, which later became known as jeans. Over the years though, denim has become a fashionable fabric used both for trendy streetwear as well as by the leading fashion couture designers. 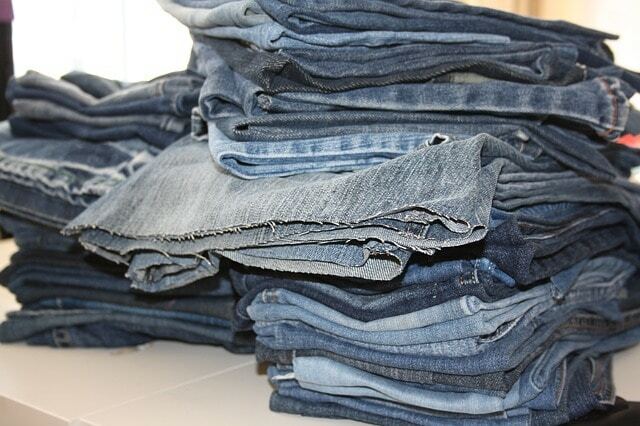 Today, the people around the world – young or old wear denim jeans and clothing on a daily basis. There is hardly anybody who doesn’t have at least one denim garment in their wardrobe today. But what is denim? The original Denim is a 100% cotton fabric which is twill weave woven for added sturdiness and durability. It has visible diagonal ribbing on the back which differentiates it from other cotton based fabrics. The warp thread is dyed in indigo, and the weft thread is left white. This is why it tends to fade in such a specific and attractive way. But there are many varieties of this fabric you should know about if you intend to be sewing with denim. Now when we explain what is denim, let’s cover the different varieties you can encounter in stores. The traditional denim, which can be treated in various ways in order to create the other types of denim. A very durable and versatile fabric, made famous by Levi’s jeans. This type has not been washed after it is dyed. Also known as unsanforized or dry denim and has a very even look, unlike the traditional distressed look of regular jeans. It is essential that you prewash the raw denim before proceeding with the sewing because it will become softer and will eliminate the risk of shrinkage. Many people prefer it because it will fade more naturally over time. This type is processed to avoid shrinkage. The most common type on the market. Traditionally it comes in blue, but is also offered is other colors. The blue color is achieved via indigo dying. For the other colors of this fabric such as grey, pink, green, mustard, black and others, a process known as Sulphur dying is used. Technically, colored denim is really twill, because “denim” refers to the indigo used for the dying process of the fabric. Adenim fabric which has incorporated stretchy fibers such as spandex or Lycra and gives it a stretch. The amount of elastane used in the fabric determines how stretchy it is. Stretch is most commonly used for women’s jeans and provides a more comfortable fit. A denim fabric which has finished edges usually in red or orange color. This finely edged denim is considered of higher quality and therefore is more expensive than other denim types. Its natural and clean edge keeps the fabric from unraveling. As the name suggests has been treated and weaved in a way which makes it look permanently crushed and wrinkled. Also known as marble denim and has a specific finish which is achieved by the fabric being soaked in chlorine and washed with pumice stones. A smoother and softer fabric than the traditional denim, due to the added polyester fibers in it. It is stretchy and is commonly used for shirts, jackets and hats. It is also quite durable thanks to the added polyester in the weave. Lighter, easier to wash and dry than regular denim, and provides a dressier look. The poly material also much more resistant to wrinkling than most other types listed here. This is un-dyed denim. It has the natural denim color without being treated with indigo. It has a canvas-like sturdiness and durability thanks to its special 3 x 1 twill construction. Commonly used for making upholstery. A double fabric which is made of denim with another lighter fabric glued to it as lining. As the name suggests, thermo fabric is suitable for clothing for colder weather, as it provides better insulation. Made of 100% cotton, organic denim is treated with natural substances such as potato starch rather than with chemicals. This one is blended with wither polyester, spandex or cotton which helps reduce the wrinkling of the fabric and also ensures that it keeps its shape. It has a silkier look which makes it perfect for dresses, overalls, and tops. A Lycra fabric which contains some denim, and has a 35 to 505 stretch. Commonly used for making women’s wear. An old looked denim which is made via stone washing, organic cellulose washing or with bleach which helps create the old and torn look of this fabric. In this type of denim, there is no difference in the color and texture of both sides of the fabric. Usually has floral, striped or batik patterns printed on it. A rare denim fabric with a unique crisscrossed pattern of the weave which develops as it fades. Made by using slub or uneven yarn for both the weft and the warp threads. Patented by Sally Fox a cotton breeder from California, this fabric is made with colored cotton fiber. It comes as no surprise that there are so many types of denim fabrics because this material is one of the most popular fabrics on a global level. This is due to its ease of use, versatility, good fit, durability, and of course the fashion factor. Denim can be used for sewing just about any type of clothing as well as for home décor items as long as you have a machine that can handle it such as these here. This is why so many sewists love working with it!